This week’s instalment of the #SBIDinspire interior design series features a local luxury oasis comprising of private villa and pool house located in southeastern France, bordering Italy and the Mediterranean Sea. 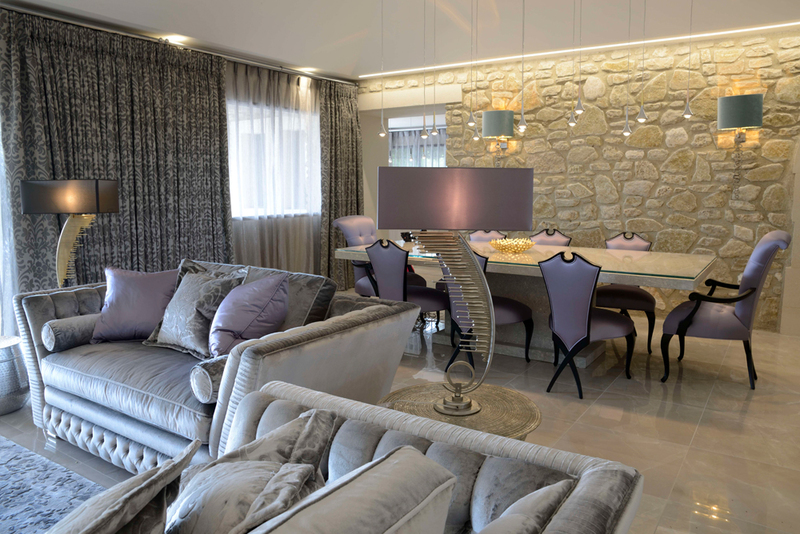 Built using the warm, honey-toned local stone, the interior design scheme was designed to reflect the authentic and characterful charm of the villa’s exterior with a subtle palette of restful colours throughout, finished with highlights of silver, lavender and turquoise to bring in the colours of Provence. The 21st century home acts as a sanctuary, but also an inviting family home so it had to be well-thought-out, sympathetic with its glorious surroundings and suitable to the needs of everyone spending time in it. This meant open-plan areas for socialising and entertaining, with cosier, more intimate spaces to provide solitude when required. To achieve the quality required by the client, and for the furniture to fit both the generous space and the colours requested, the majority of pieces were individually designed by Juliettes Interiors as bespoke items. The brief was straightforward: to create a light, airy pied-à-terre using the finest European furniture and incorporating the colours of Provence. Above all, it was to be comfortable, relaxing and sociable with a focus on quality. This was to be a sanctuary but still a place to share with family and friends. 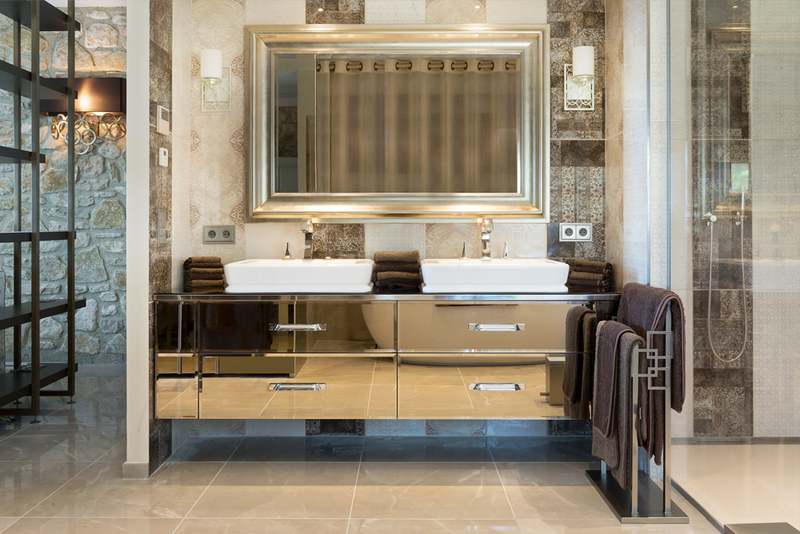 The client’s architects had already specified finishes for floors and walls so, for Juliettes Interiors, it meant coming into the project part way through. Taking this in our stride, we quickly got ourselves up to speed, working seamlessly with contractors and taking the project through to completion and final snagging. Initially, the client intended to design and project manage this renovation himself but ran into problems with communication, space planning, design and trying to pull everything together. He later admitted that he felt as though he was drowning in the project management of a villa that had been bought to provide a respite from the hurly burly of everyday life. He originally came to us simply to source a couple of bedside tables but this proved to be a turning point for the project. Talking through his ideas with Design Director Micaela Rossi, he realised that, as well as sourcing the items he was looking for, we could provide a complete interior design service as well as taking on full responsibility for procurement, product design, space planning, installation and project management. From a couple of bedside tables, Juliettes Interiors ended up specifying and sourcing new bathrooms as well as all interior furniture, outdoor and pool furniture, fabrics, finishes, lighting, bed linens, curtains and accessories. 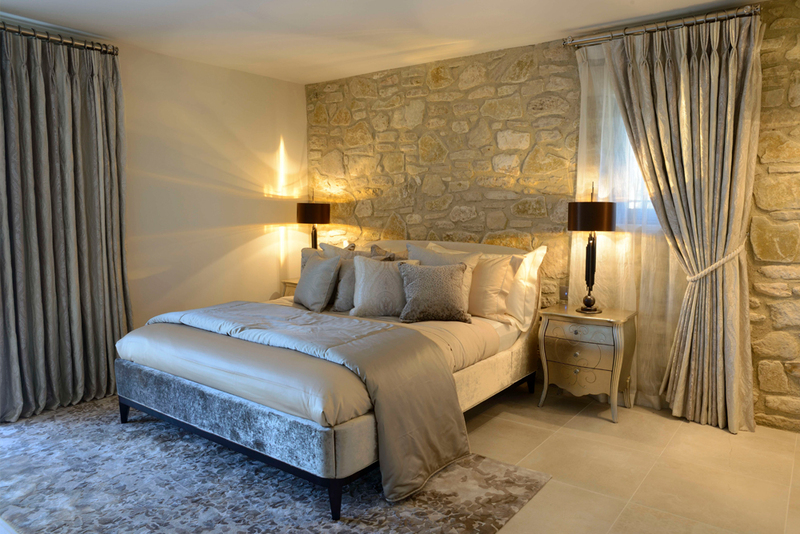 This was a beautiful, traditional Provence villa on the outside, constructed using the warm, honey-toned local stone. However, none of this character followed through to the bland, dated interior. Using this local stone throughout the interior brought warmth and texture to every part of the villa and its pool house. We also used the soft greys, greens and lavenders of the spectacular Provence countryside as our base colour palette to create the calm, restful and welcoming space the client craved as a retreat from his hectic day-to-day lifestyle. The main house comprised 4 en-suite bedrooms plus a housekeeper’s apartment, and a large hallway leading into an extensive, open plan living area. Together with a further 2 bedrooms, 2 bathrooms and a large kitchen/living space in the pool house, this gave us plenty of scope to transform the tired, uninspiring interior and turn it into a well-thought-out and functional 21st century home, sympathetic with its glorious surroundings and to the needs of everyone spending time in it. The finished villa, pool house and pool area blend beautifully into the surrounding countryside, with natural, local materials, honey-coloured stone, thoughtfully-landscaped gardens and restful colours designed to reflect the tones of the encompassing hillside. Inside, the design team used clever lighting and coordinating colours in shades of lavender, grey and turquoise to bring in elements of the Provençal landscape. They have made the most of the expansive, open plan living area, creating open spaces for socialising, dining and entertaining, along with cosy nooks and more intimate spaces, plus a TV snug and library. The pool house is perfect for visiting guests with its 2 cool and airy bedrooms, stunning contemporary bathrooms and a fresh, open plan living and kitchen area. The client could not have been happier with the finished project. Every item of furniture was exactly as he had envisaged. Skilled project management meant that delivery and installation all went off without a hitch and snagging was minimal. Set in its extensive, spectacularly landscaped gardens, the villa is now a sanctuary of peace and harmony, an oasis of tranquillity away from the hustle and bustle. Originally intended as a bolt hole for brief visits, the client instantly fell in love with this gorgeous home and admits that he now spends most of his time there. Due to the client’s hectic international schedule, much of the day-to-day communication was carried out online. There were only 3 further face-to-face meetings at the showroom to finalise furniture layout, agree technical drawings for the many bespoke items, and to choose colours, fabrics and finishes for furniture, light fittings, curtains and linens. Almost every item of furniture was fully bespoke or at least customised, meaning a lot of research into special finishes and an exceptional level of detail. Throughout the project, we made visits to the property to take accurate measurements, to appraise the villa and its pool house, and to explore its surroundings. This has been one of the most interesting and exciting projects we have worked on and we loved every minute of it. Obviously, we were delighted at the client’s reaction and the fact that he now considers this his main residence. However, we have to admit, for our design team, winning a 5 star award for our design, skills, creativity and the standard of our service was a key highlight for the outcome of the project. If you missed last week’s Project of the Week featuring a boutique hotel juxtaposing the austere beauty and fiery drama of Iceland’s natural wonders, click here to see more.